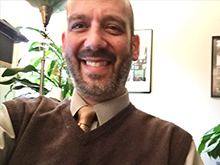 My name is David Goldberg and I am a licensed clinical psychologist and psychoanalyst who has been practicing for over 20 years. My office is located in the Mountain Brook area of Birmingham, Alabama. My office hours are typically 7:30am– 5:30pm M-F.
After earning my doctorate (Psy.D.) I went on to graduate from the San Diego Psychoanalytic Institute and Society in adult psychoanalysis. In addition to my private practice I serve as Clinical Assistant Professor and Director of Psychodynamic Psychotherapy Training in the Department of Psychiatry and Behavioral Neurobiology at the University of Alabama-Birmingham School of Medicine. I am also on the faculty of the New Orleans-Birmingham Psychoanalytic Center. I am licensed in both Alabama and California. I have experience treating a range of psychological problems including depression, anxiety, problematic relationship relationship and sexual issues, loss and grief, self-destructive behavior and persistent problems in the ability to work and love. I provide psychotherapy, specifically psychodynamic therapy and psychoanalysis. This approach is a more in-depth, typically open- ended process meant towards getting to the root of long term conflicts and problems. In this way, psychotherapy is more feeling and experience oriented and aspires to be life changing. In distinction to psychotherapy, counseling is more focused on life management and adjustment. The characteristics of counseling include guidance, encouragement and education, typically using specific exercises and assignments, in a more behavioral focus. I would be more than happy to speak with you if you have any questions or would like to consult. Simply call me and I’d be delighted to speak with you personally—I’m usually able to return calls within 24 hours.